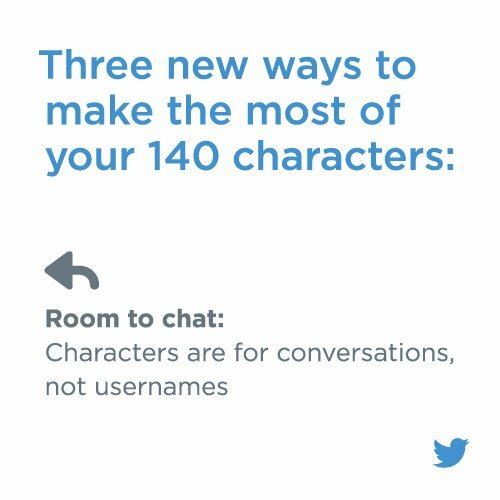 Social media rules change all the time, but Twitter’s 140 character limit is one of the most long-standing. Driving markers crazy for years, the sometimes restrictive feature has also helped us become more concise in our messaging – helping us craft captions, comments, questions and more in such a short amount of space. Meant to mimic the 140-character limit of early text messaging, the feature has been apart of the site since the beginning. Recently, Twitter has changed the rules so you can get more from your tweets. Image attachment URLs and usernames no longer count towards your 140 character limit, allowing you to tag more people without having to shorten your actual message. In addition, polls and gifs are also no longer counted in the limit and accounts can now retweet themselves to re-share a message that didn’t get enough traction the first time.So what does this change mean for brands? A whole lot! Having more space gives you the chance to be a bit more creative with your wording, linking and more. Sometimes, the perfect caption needs a little more space to breathe! This also gives brands more space to add images and video to their posts much more often, since you often have to choose between a great tweet and using the space for an image URL. Though web links will still count towards the character limit, having more space will likely mean wordier, more creative posts from brands using much more visual media than ever before. This is especially perfect for brands who do customer service via Twitter (which most should!). Instead of having to send multiple tweets when speaking directly with one or more followers, you can fit your messaging into one tweet instead. This is helpful for when you need to send the same information to multiple users who have asked the same questions. You can send all the information they need without compromising your message in any way. This will make your stream look much less cluttered since you’ll need fewer separate messages when dealing with individual followers. Picture this: the perfect caption, with the perfect image attachment and the appropriately tagged users and even a great hashtag; but you’ve exceeded the character limit by 1 or 2. You decide that the image, hashtag and other parts of the post are essential and decide to play with the wording of the tweet itself, but sometimes things are written so concisely it’s hard to chop it down even further. Many brands (and marketers, and people in general) opt to commit a “grammar sin” to save space. They default to shorthand like “2” instead of “to” , slang and even skip commas and apostrophes to fit everything in. Having more space means brands will have to make those compromising choices much less often. Whether it’s the wrong day or time, tweets sometimes go unnoticed by the majority of our timeline. Now it’s much easier for brands to once again share said posts so they’re not lost forever. This is especially perfect for adding in any updates to the information originally posted, keeping your followers in the loop about any changes. While you could copy and paste the link to the original tweet previously, this makes it a much simpler process.